The series of strong earthquakes on 14 April 2010 killed at least 400 people and injured more than 10,000 as houses made of mud and wood collapsed and trapped many in the cold weather. 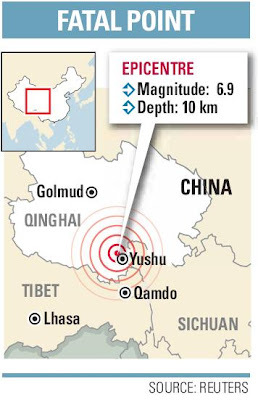 The largest quake was measured by the US Geological Survey to be of magnitude 6.9. Communication broke down and made rescue work more difficult. As many of you would have learnt in Geography, the damage by an earthquake is affected by many other factors than just the magnitude of the earthquake. In the latest report, death toll might be as high as 10 000! 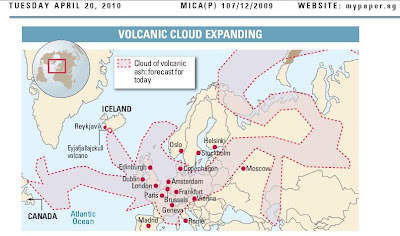 A volcanic eruption in Iceland (Eyjafjallajökull volcano) had made the headlines all over the world - a real life example of the scale of impact an activity/event can have on all of us globally. 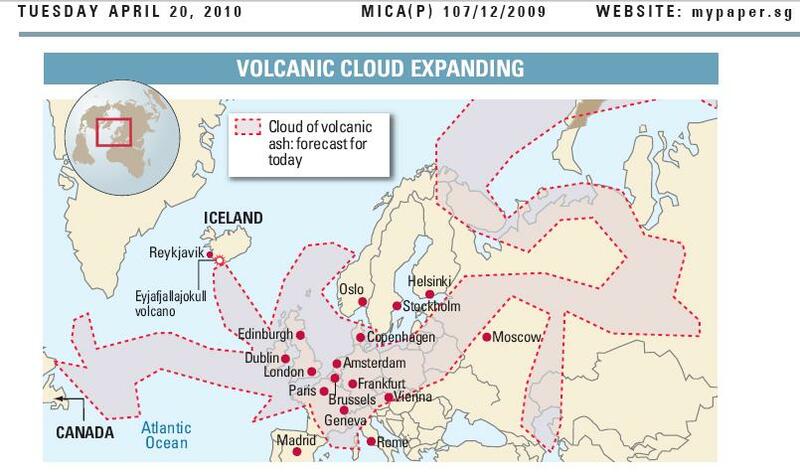 The emission of the ash from the volcanic eruption had totally crippled the air transport. Airlines suffered great losses economically as all flights to and in Europe had to be cancelled. Tourists were stranded not only in Europe but also in other parts of the world. Just read from Channel News Asia how some hotels pushed up the hotel rates - one tourist in HK complained that the rates in his hotel increased from 160 Euros to 800 Euros! I must say that this is extortion! Many of those stranded were also worried about how it would affect their jobs and loss of income. Those who were stranded in Singapore even have to seek accomodation across the causeway or in Bintan as most of the hotels were fully booked. Thank God this volcanic eruption did not impact on the global climate as Mt Pinatabu did. Volcanic eruptions can lower the earth’s temperature for a few years because sulfuric gases can absorb and reflect back the sun’s radiation. When Pinatubo erupted in 1991, global temperatures drop by about 1 degree Fahrenheit (0.6 degrees Celsius) until 1993, according to the U.S. Geological Survey. Some positive impacts - increase in the demand for land and sea transport in Europe as well as an increase in the use of online conferencing such as SKYPE. 2 Response to "Earthquake in Qinghai China and Iceland volcanic eruption"
thank you for the informatlon. it has been very useful to me. thanks a lot for the information. it has been very useful to me.